1 : 31680 This drawing covers a section of the Lincolnshire coast from Humberstone in the north to Mablethorpe in the south. Down the right of the sheet, the sandy beaches characterising this stretch of the coast are represented by banks of fine dots. Salt marshes are indicated by areas of grey shading. Further inland, the map shows the ditches and dykes constructed to drain the fens. Metcalf, Edward B. 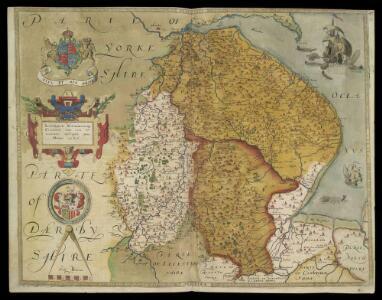 Description: This is a map of Lincolnshire and Nottinghamshire by Christopher Saxton, dating from 1576. It forms part of an atlas that belonged to William Cecil Lord Burghley, Elizabeth I’s Secretary of State. Lord Burghley used this atlas to illustrate domestic matters. This map is actually a proof copy of one which forms part of Christopher Saxton’s Atlas of England and Wales. This atlas was first published as a whole in 1579. It consists of 35 coloured maps depicting the counties of England and Wales. The atlas is of great significance to British cartography as it set a standard of cartographic representation in Britain and the maps remained the basis for English county mapping, with few exceptions, until after 1750. During the reign of Elizabeth I map use became more common, with many government matters referring to increasingly accurate maps with consistent scales and symbols, made possible by advances in surveying techniques. Illustrating the increasing used of maps in government matters, Lord Burghley, who had been determined to have England and Wales mapped in detail from the 1550s, selected the cartographer Christopher Saxton to produce a detailed and consistent survey of the country. The financier of the project was Thomas Seckford Master of Requests at the Court of Elizabeth I, whose arms appear, along with the royal crest, on each map. Burghley has annotated this map, adding place names adjacent to the tributaries of the Humber. A battle is depicted at the mouth of the Humber, perhaps reflecting the military importance of Hull which was heavily fortified by Henry VIII and then repaired during the Elizabethan period in readiness for the threatened Spanish invasion. The map was engraved by Remigius Hogenbergius, one of a team of seven English and Flemish engravers employed to produce the copper plates for the atlas.